Delivery that will brighten any day. 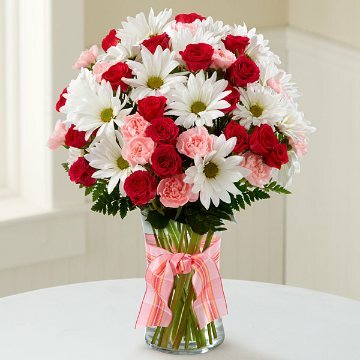 Sending a Sweet Surprises® Bouquet by FTD® is an absolutely charming way to send your warmest sentiments. Hot pink spray roses, pink mini carnations, white traditional daisies and lush greens are sweetly situated in a classic clear vase accented with a perfectly pink designer ribbon to create a bouquet that will delight your special recipient at every turn. Standard bouquet includes 10 stems. Approximately 13"H x 10"W.
Deluxe bouquet includes 13 stems. Approximately 14"H x 11"W.
Premium bouquet includes 17 stems. Approximately 15"H x 12"W.